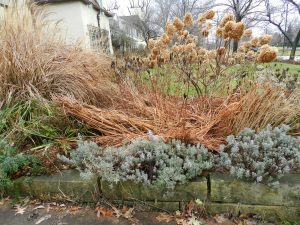 The wispiness of Miscanthus, the bronze foliage of Iris siberica, the gray-green foliage of Lavandula, and the large panicles of Hydrangea paniculata enliven this fall and winter landscape. 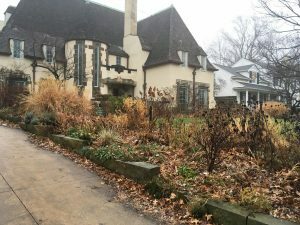 Every year, I despair at the number of people who hire landscapers to blow leaves out of their beds and cut everything herbaceous (perennials and ornamental grasses) to the ground. An article written for the latest issue of Horticulture magazine by Kelley House, a Certified Professional Soil Scientist, and Kate Norvell, a Certified Professional Soil Scientist and Certified Prosfessional Agronomist explains why this is a despicable practice. On purpose or unintentionally, many gardeners have left plants in their gardens over the winter. This is a good thing: everyone should consider doing so on a yearly basis. Scientists, specifically agronomists and soil scientists, refer to the plant litter that remains after a harvest, as “residue”. Leaving residues in place over the winter, instead of pulling up or tilling them into the soil surface, provides numerous benefits for the soil and your garden. Plant residues reduce erosion and the loss of valuable topsoil. Residues cover soil and protect it during the non-growing season. They catch rainfall, reducing the impact that individual rain droplets have with the soil surface. Residues also slow any flow of melting snow over the soil. Both of these actions help protect the soil structure, keeping it intact for next year’s crops and gardens. Plant residues provide shade, regulating soil temperature. This keeps soils cooler during the non-growing season to the early part of the next growing season. Cooler soil temperatures provide more suitable conditions for soil microbes. Microbes are necessary for maintaining a productive soil for crop and plant growth growth. Cooler soil temperatures also aid in the retention of soil moisture, which in turn is favorable for seed germination in the spring…. In sum, residues create microhabitats of moist, even-temperature, microbe-rich soil to the benefit of plant seeds and seedlings. Lastly, plant residues provide a source of organic matter for the soil. Organic matter is essential to soil health. It helps create an environment supportive of growth. Organic matter provides an energy source for soil microbial populations, which results in faster decomposition rates, releasing essential nutrients for crops and garden plants. Soil organic matter also helps maintain good structure of the soil itself. This further reduces erosion and improves water infiltration and soil aeration. 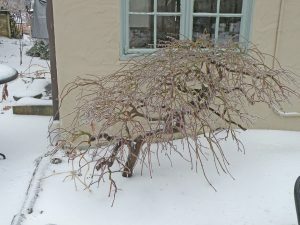 The architecture of this dormant Japanese maple is best seen during the winter. To me, a garden that appears to have nothing in it during the winter is very depressing. 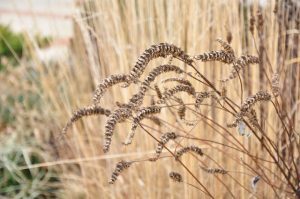 I love looking at the stalks and seedheads of the perennials and ornamental grasses as well as the varying colors and structures of my conifers and the architecture of deciduous trees and shrubs. 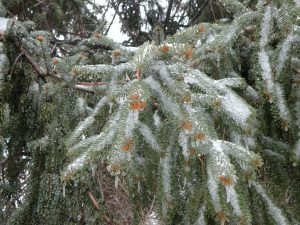 When covered with snow, and I have a feeling that this is going to be a very snowy winter, the garden becomes a series of sculptures. 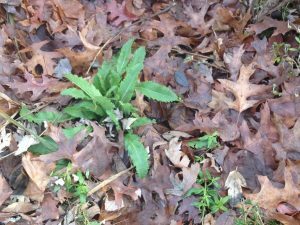 Don’t you want to love your garden during the winter? As always, a great article, Bobbie .